Why did it take some so long to think up chicken thighs with balsamic barbecue sauce? Simple, easy, and made with pantry staples, such as ketchup, honey, balsamic vinegar, and soy sauce, this meal comes together quickly. Take advantage of late-season corn to round out the meal. 1. Preheat the oven to 425°F (220°C) or preheat the grill on medium-high. 2. Husk the corn. Slather the ears with butter and sprinkle with Montreal steak seasoning and a few grinds of pepper. Wrap each ear of corn individually with aluminum foil. Season the chicken thighs with 1/2 teaspoon steak seasoning. 3. If using an oven: Line a large rimmed sheet pan with aluminum foil and place it in the oven to preheat. Remove the sheet pan from the oven and arrange the chicken thighs on one side of the hot pan and drizzle with the olive oil. Place the wrapped corn on the other side of the pan and roast until the chicken registers 165°F (75°C) on an instant-read thermometer, about 20 minutes. If using a grill: Grill the chicken thighs and corn, turning once or twice, until the chicken registers 165°F (75°C) on an instant-read thermometer, 5 to 10 minutes. 4. While the chicken thighs and corn cook, in a medium bowl combine the ketchup, balsamic vinegar, honey, soy sauce, and garlic. 5. Brush the chicken thighs with the barbecue sauce and return to the oven or the grill just until lightly charred, about 5 minutes more in the oven or just 1 minute more, turning once, on the grill. 6. Remove the chicken and corn from the heat and brush the chicken once more with the sauce. Pile the chicken and corn on a platter and pass the remaining barbecue sauce on the side. This chicken thighs with balsamic barbecue sauce is a wonderful and super easy one-pan meal that’s sure to be a hit! The chicken thighs roasted up perfectly juicy and the individual foil-wrapped buttered corn on the cob results in very sweet, tender corn with that characteristic “pop” when you bite into it. I’m not particularly fond of Montreal Steak seasoning on chicken or corn. I found the flavoring very overpowering on both, so I will opt to omit this seasoning the next time around. Two, the balsamic barbecue sauce was good, but had a much better and more complex flavor after it was cooked on the chicken and became a nice thick glaze. I will also substitute raw minced garlic for powdered, since the brief five minute glazing doesn’t have time to mellow the bite of the garlic in the sauce. I think simmering the sauce while the chicken roasts will greatly improve the flavor profile of the sauce, especially as it’s also to be used as a glaze when serving. An overall great weeknight dish to add to the rotation, especially when fresh corn is in season. This is the best rich and tangy barbecue sauce I’ve ever eaten! I cannot believe that it took me all of these years of home cooking to finally make my own barbecue sauce. I will never have bottled barbecue sauce again. What makes this recipe even more user-friendly is that it can be cooked as a sheet pan dinner with zero cleanup. My kids and I gave the sauce and the chicken a score of a 10 and the corn only an 8 as the store-bought Montreal steak seasoning was too peppery for us (which is odd because we love black pepper)! This chicken thighs with balsamic barbecue sauce is a lovely recipe with the added bonus of being ridiculously easy and quick to rustle up. There is very minimal prep and minimal washing up afterward. For a busy family, all of this translates to WINNER! Skinless chicken thighs is a nice option for reducing fat content or for a lighter dish. Despite being boneless, the chicken does not dry out due to plenty of glaze. Buttered corn is delicious and the addition of steak seasoning gives a nice result. I will definitely prepare corn this way again. All in all: delicious, finger-licking crowd-pleaser of a dish. I definitely recommend. I'm keeping this chicken thighs with balsamic barbecue sauce recipe solely for that sauce--it's that good! I love that it's made completely with things I already have laying around in the pantry and that it comes together quickly. 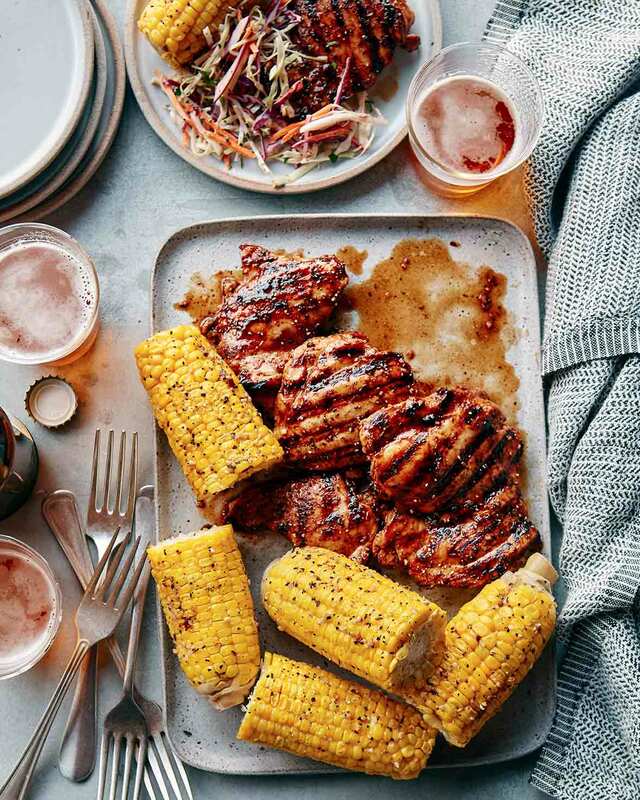 It's great for a backyard cookout (I mean, grilled chicken and corn? Classic! 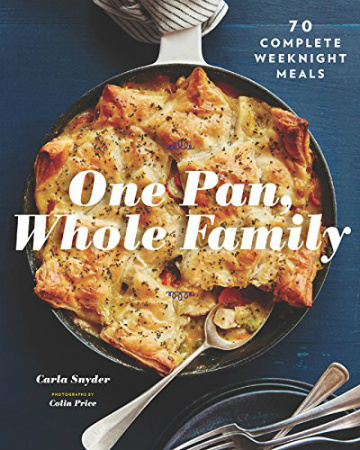 ), but also is fast enough to make a nice weeknight meal or a last minute dinner for company. This is going to become my "go to" chicken sauce. It works well when you only have a little bit of time and you brush on the sauce as you cook the chicken and even better when you marinate the chicken for a few hours beforehand. Love that it uses ingredients I always have on hand—makes for a quick, flavorful meal even on busy weeknights! I made these a few different times and the most success I had was marinating the chicken for a couple of hours before grilling them. Because the sauce drips down on a barbecue, I liked using a silicone sheet that's made for the barbecue to cook these on—no mess, no fuss (and no fires!). Marinating prior to cooking gave the most flavor and was the least fuss. Since starting as a tester for Leite's Culinaria, I’ve discovered the beauty of boneless, skinless chicken thighs and I use them often now. This recipe for chicken thighs with balsamic barbecue sauce is so simple and fast and as the author suggests, it’s perfect for hot summer evenings. I am also a sucker for balsamic vinegar on anything; the sauce used in this recipe is sweet and tangy. I will absolutely make this again, likely even just the five-minute for ribs. I don't use Montreal steak spice as I tend to prefer my steaks "naked" with sea salt. Instead of buying it, I made my own and I stumbled on a recipe I quite like because it was heavy on the paprika and dill. Grilling the corn slathered in butter and the seasoning mix results in a delicious and juicy cob with a lot of . I don't have access to a barbeque but used my cast iron stovetop grill and didn't find that it required that much extra cooking time, although I definitely needed to run the fan and disable the fire alarm. It was quite sweet and salty—and so delicious. We ate it with potato salad and pickled red cabbage. It was definitely enough for 4 people with the sides included, I would say you could feed 6 easily. The prep is simple and the results are fantastic. And the leftovers were just as good the next day. Delicious, simple to make and a family crowd pleaser! This recipe fed two adults and one child. Will definitely try this recipe again. The balsamic adds just a hint of tanginess to the otherwise sweet glaze. Hands on time, about 30 minutes, cooking time, about 15 total. I used low-sodium soy sauce because I figured the Montreal seasoning had enough salt. After the initial ten minutes on the grill, turning twice, I got a nice char on the chicken after I sauced it with just 1 minute per side on the grill. I'm glad I didn't add the glaze any sooner or I think it would have burned with all the sugar in it. Chicken Thighs with Balsamic Barbecue Sauce Recipe © 2018 Carla Snyder. Photo © 2018 Colin Price. All rights reserved. All recipes and photos used with permission of the publisher.